MERCURIAL VAPOR IX - PITCH INVASION! MERCURIAL VAPOR IX – PITCH INVASION! 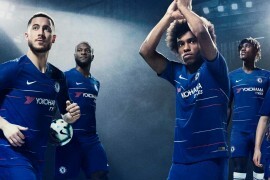 Like clouds gathering before a storm, you can always tell when a new boot launch is close on the horizon when players slowly start to reveal non-blacked out versions of a new boot. And given how bright it is, there’s really no missing the Nike Mercurial Vapor IX! We’ve had plenty of Tweets, Facebook shouts and good ol’ fashioned emails from keen-eyed boot-spotters around the world who have caught a glimpse of the ninth incarnation of the legendary Mercurial Vapor. 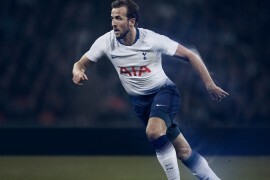 Nike have definitely broken the mould with marketing the Mercurial Vapor IX, which is definitely a refreshing change from the usual cycle of endless black-outs. Nike can always count on Ronaldo to launch a new boot – the Madridista has racked up 5 goals in two games wearing his new boots! 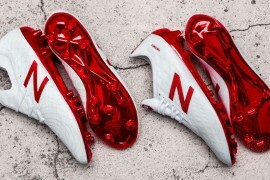 Rather than worrying about leaks from catalogues and dodgy photos from trade events tainting the launch of the new Vapor IX, Nike instead took the reigns and revealed the boots unexpectedly, with a Cristiano Ronaldo-exclusive custom version in a colourway that was (presumably) designed and produced only weeks ago. Since then, we’ve seen a handful of stars breaking out the new Vapors in what we are expecting to be the two launch colourways. Leo Baptista of Rayo Vallecano was the first we saw (pointed out by Twitter BFF @Box_to_Box), lacing up a ‘Sunset’ pair for a match this weekend. 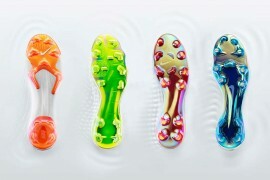 Following hot on his heels were two of Europe’s leading Vapor wearers; Franck Ribery and Xherdan Shaqiri. The two Bayern Munich stars took advantage of an exhibition match against Schalke 04 in the the Far East to road-test their latest football boots over the winter break. 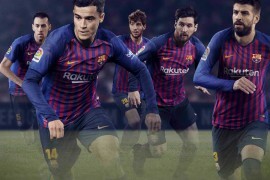 Best of all, the two Wingers were wearing both of the expected Nike Mercurial Vapor IX launch colour schemes; Ribery in the sublime-looking ‘Fireberry’ and Shaqiri joining Baptista in the stunning ‘Sunset’. Twitter can also be relied on for professional footballers doing things they shouldn’t, and Alex Buttner of Manchester United is the guilty party this time! 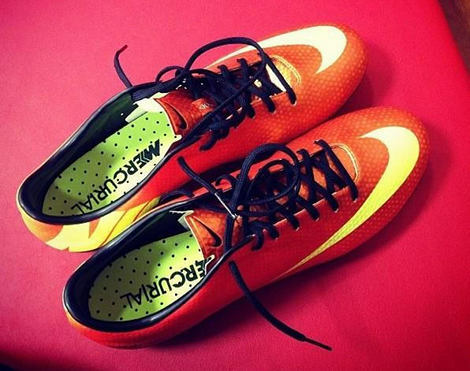 The Dutch youngster was so pleased with the Nike Mercurial Vapor IX, he took to the social media site to show off a picture, giving us a good-up close look (after @DDChile pointed it out to us!). 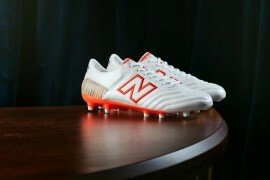 We’re curious, though – is the ‘dimpled’ upper a really minute detail like the evoSPEED? Or are we looking at something more textured, like the control zones on the CTR360 III? Either way, we’re excited! Hyped for the Mercurial Vapor IX launch? Let us know in the comments! can’t tell the difference other than the pimpled skin. it will be hard to improve such a well done boot. but i guess something funky with the skin improve control touch feel will work. no more plastic reinforcement on the toe..mmm..